Alison Kent – Escape Reality, Read Fiction! Holiday Kissses from Carina Press is another book in their terrific Christmas anthologies. I say terrific because the formula they use is terrific. They publish the four stories together under one theme, and people have the choice to purchase all four together, or, they’re available separately. This is a terrific solution to the “your mileage may vary” problem usually found in anthologies. There’s the obvious theme in this collection. Okay, there are two obvious themes. It’s a romance anthology. And it’s a collection of romances centered around the Christmas holidays. But I noticed that all the stories had the additional theme of second chances. In every story, either one of the couple is getting a second chance at life or love, or they are taking a second chance on their relationship. Or in one case, it may be a fifth, sixth or tenth chance. You’ll see. This Time Next Year by Alison Kent is the story of a woman with a plan for her life, and a man who has given up on all of his. Brenna Keating plans to follow in her family’s footsteps. After one last Christmas with her grandmother in the North Carolina mountains, she’s off to take her nursing skills to far-flung outposts, just as her grandmother did and just as her parents currently are. Instead, a blizzard wrecks her car, and she is snowbound for three days with Dillon Craig, an ex-Army doctor with PTSD who has practically become a hermit. Sharing the cabin forces Dillon to confront his self-imposed distance from the world, and his familiarity with Brenda from his conversations with her grandmother help him begin to break down the walls he has built between himself and others. The sexual chemistry between them is impossible to ignore, being as they are snowbound in a small cabin. But when the roads are clear, has Brenda build enough of a bridge for Dillon to take a second chance at living a full and real life? Escape Rating A: There was a lot packed into this story. All the characters are multi-layered, including Brenda’s grandmother. Brenda’s family history and her need to establish herself also play a big part in this surprisingly meaty tale. Jaci Burton’s A Rare Gift is about a crazy idea that works. Calliope Andrews needs to build an addition onto her day care center. Of course, she wants to hire the best construction firm in town for the job. There’s this one problem. The man who owns that firm is her ex-brother-in-law, Wyatt Kent. Not only was his divorce from her sister really nasty, but Calliope has had a crush on Wyatt since the first time he walked into her parents’ house. But Calliope’s not sixteen anymore, and she wants Wyatt for herself this time. All she has to do is get him to see that she’s the right sister for him. And figure out a way to deal with family reunions with his hopefully once and future in-laws. Escape Rating B+: This was just a fun story. Going after your ex-brother-in-law is a little odd, but it works. Calliope’s maneuvering so that everyone gets closure and can move past the very icky past was a tad manipulative, but necessary in context. This one is just good fun. 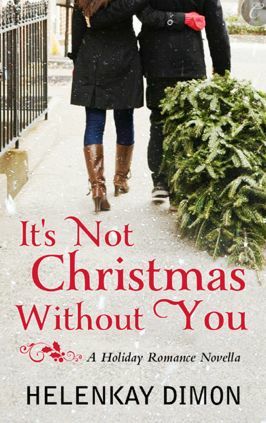 It’s Not Christmas Without You by HelenKay Dimon is about a young couple with very different dreams. Carrie Anders and Austin Thomas have gotten together and broken up over and over (and over) again. But this time Carrie thinks it’s for good. She took a job at a big museum in Washington, D.C. because that’s her dream. And Austin, well, he just never really listened when she talked about her dreams. He’s always been sure that her dreams of arranging major museum exhibitions are something she’ll outgrow. Where his dream of working at, and eventually taking over his family tree farm are what’s really important. And Austin is certain they are meant to be together. So he rents the corner lot next to her apartment building in DC to sell Christmas Trees and brings a little bit of their West Virginia country to DC to convince her that she’s meant to come home with him. But it takes a major event at her museum, one that she arranged, for him to finally start to listen. Escape Rating C: This was the weakest story in the collection. Austin was too smug for too long for any woman with a spine, which Carrie has, to have forgiven him that easily. It just doesn’t quite work. 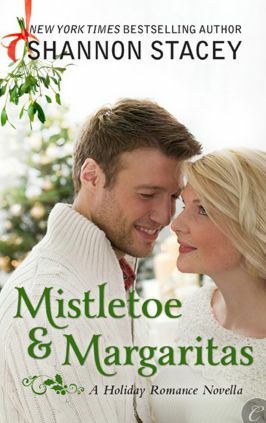 Mistletoe and Margaritas by Shannon Stacey is a terrific “friends into lovers” story that happens to take place at Christmas. Claire Rutledge has been a widow for two years. She’s held her life together with the help of her best friend, Justin McCormick. What Claire doesn’t know is that Justin has loved her since the very first moment he saw her, but his best friend Brendan got there first, and married her. But for the last few months, Claire’s been having some “extra-friendly” thoughts about Justin, not knowing that Justin would be more than eager to reciprocate. Until, after a holiday party where they both have just enough margaritas to let their drinks do the talking, they cross the boundary from friends to lovers, at least for one night. The question is, can they be be both? And can they build something new and wonderful without Brendan’s ghost getting in the way? Escape Rating B+: Anyone who enjoys a good “friends into lovers” story will love this one. I love this formula of Carina’s, I hope they do this again next Christmas. Reviewer’s note. A much shorter version of this review was posted on Library Journal’s Xpress Reviews on December 16, 2011.